The Kensa Group has announced changes to its senior management team and additional business services as it celebrates its 20th anniversary. James Standley has been promoted to Managing Director of Kensa Heat Pumps, whilst Dr Matthew Trewhella will step up to the same role for Kensa Contracting, the specialist in-house installation business, which launched of a dedicated website earlier in the year. 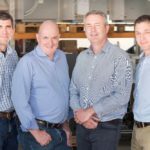 Alongside the management changes, Kensa has announced the launch of a new Group business, Kensa Utilities, which will operate alongside a number of partners to fund, own and maintain heat pump assets. In addition, the Group is developing alternative business models, including a ‘heat as a service’ offer, designed to reduce upfront capital costs.